Contacts Sort for Gmail™ /Google Contacts . Sort Gmail contacts by date added, company name - now as Google Sheets Add-on and Chrome App. NEW - One more way to sort your Gmail contacts, Contacts Sort Add-on for Google Sheets now available in Google Sheets Add-ons Store. You can sort by Name, Company name, last modified date, email address, job title, phone number in ascending or descending order. Option to list all Gmail contacts or contacts from the selected group along with many contact fields with "Last Modified" date. You can use this add-on in a new Google Sheets or in your existing sheet. To install - Open a new sheet in Google Sheets and just visit this Contacts Sort Add-on link. Contacts Sort App - Chrome App - Now faster and better. Visit Chrome Webstore to Install. - Loads your contacts faster than the extension. - Shows your contacts in a new browser tab. You can keep the contacts tab open as long as you want. - Quick access to all the settings on the same screen. - Since this is a Chrome App, can be installed on Chromebooks. - See complete list of features below or see the Contacts Sort App listing in Chrome webstore. 1. Option to export your Gmail contacts in the sorted order as CSV file, which can be used to import into other applications. 2. Search by Name with auto-suggestion. Contacts Sort for Gmail™ is a Chrome browser Extension that displays your Gmail™ Contacts in a business card layout similar to Contacts view in MS-Outlook. You can also sort the contacts in different ways like - by date added or by oldest, by contacts with or without pictures. Being a chrome browser extension it allows one-click access to your contacts even when you are not using Gmail. Get quick access to your Gmail contacts even when you are browsing other websites. Filter options to view contacts added, modified before, after or between any two dates. FREE DOWNLOAD Visit Chrome Webstore to Install. Shows the total number of contacts in the Chrome toolbar. Contacts that doesn't have a photo are differentiated with a grey icon while contacts with a photo can be identified by a green icon. Sort by the newest or last modified contact. View only the contacts that doesn't have a photo. Sort Gmail contacts in alphabetical order. Option to limit the number of contacts to show. Show contacts added/modified before a date. Show contacts added/modified after a date. View contacts added/modified between any two dates. Email support@pppindia.com for any issues or to recommend any new options. 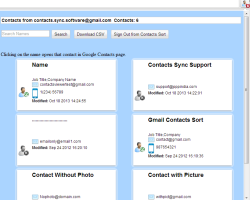 Contacts Sync - Synchronize Outlook Contacts with Gmail - Freeware and Pro version. 2way contacts sync, sync Outlook Categories, pictures, notes, sync by last changed contact and more. Back to Contacts Sync webpage. Visit gmailextractor.com to Extract Email addresses from Gmail Inbox & mail folders/labels. Download extracted emails as .csv file. Extract From, To, Cc, Subject, Date, email ids in message body. Gmail Email Extractor. (Online version) Extract from Squarespace contact forms, Wix contact forms, ebay order mails and more..
Delete all Gmail Contacts and Contact Groups at once. Gmail limits to you select and delete only 250 Contacts at a time. Use Easy Contacts Delete for Gmail to delete all Gmail Contacts at once. Option to choose a single group to delete Gmail contacts in bulk. FREE DOWNLOAD. Visit Home Page || Extract Emails from Gmail || Calendar Sync || Extract Email from Yahoo Free IMAP Email Extractor for Yahoo and any email account.